Snowshoeing is a great way to get outside during the winter and enjoy hiking in the beautiful mountains of Park City, Utah. With a snowpack that can get over ten feet deep, the broad base of snowshoes helps you stay above the snow as you explore, and the crampons on the bottom give you better traction in slippery spots or when climbing or descending hills. 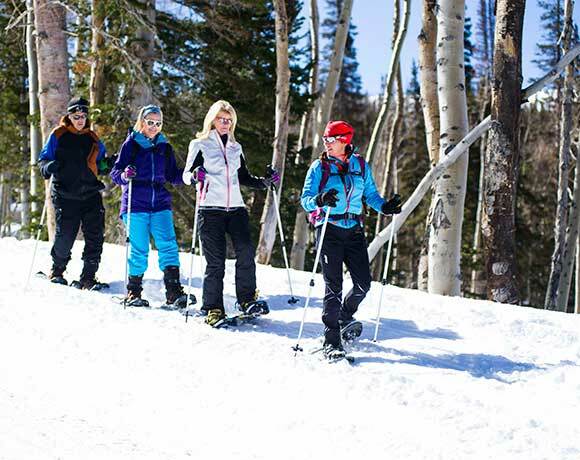 Snowshoeing in Park City is a family-friendly activity ideal for all ages! At Jans, we rent Atlas snowshoes in varying sizes, including women’s-specific, and kids’ sizing, to help make the sport comfortable for everyone. There’s lots of great snowshoeing to be had right in Park City, and you can head out on trails directly from our White Pine Touring and White Pine Nordic Center locations. Or, if you’re looking for more of a secluded, backcountry feel, you can explore beyond town in the nearby Uinta Mountains. You’re welcome to rent from us and go out snowshoeing on your own. Be sure to ask our Experts the best spots in town to snowshoe or their favorite hidden gems in the backcountry. Or, if you prefer, you can always book one of our professional guides to show you best places to go snowshoeing. 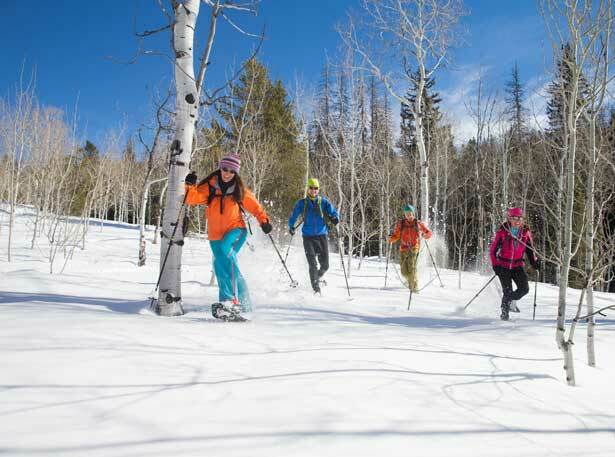 Why Snowshoe in Park City? Even though Park City is well-known for its amazing skiing, many have discovered that snowshoeing is an excellent alternative outdoor activity during Park City’s winters. You can head out alone to find solace, or with your family and friends – and snowshoeing is also quite dog-friendly. Whether you’re looking for peaceful moments or rollicking good times, snowshoeing is a great way to explore the mountains beyond the crowds often found at the area’s ski resorts. Snowshoes can even be used for running out on the snow, for those who want more of a challenging cardio workout. To stay warm without overheating while snowshoeing, you’ll want to dress in layers so that you can easily regulate your temperature. Your clothing should be breathable and moisture-wicking to draw perspiration away from your skin and in turn, keep you comfortably dry. Waterproof snow boots, rather than sneakers or rain boots, are the best footwear for snowshoeing for the same reason.